Delete or Unsubscribe for mail list? I checked our bounced emails report. Do you want me to “unsubscribe” or “delete” them? I’ve just “unsubscribed” a couple and then realised “delete” is also an option. What’s the difference? Also if a contact says “this address has been cleaned” there is no delete of unsubscribe option. Why is that and what does it mean? This is a great question because list hygiene is an important (but frequently ignored) part of being a responsible direct marketer. List hygiene is all about keeping your list up to date, as far as this is possible. Now people move jobs all the time and so being 100% up to date is unrealistic – but each time you send out an EDM (electronic direct mail message) there will be people whose emails bounce or they choose to unsubscribe. The unsubscribe option means they stay on the list as a historic record (they were once subscribed and now are not). Basically, if there’s the possibility that they might re-join your list in the future, it’s better to leave them on the list. Similarly, if they change jobs and get a different email address, it’s best to leave them on the list and at a future date, change their email address. So by leaving them on the list we have a “more perfect” record of history for that subscriber on your list. Cleaned contacts have addresses that have hard bounced, or repeatedly soft bounced, and are considered invalid. So they have been permanently deactivated and in order to protect the spam sending record of emails sent through the MailChimp servers, they have chosen to not allow you to send to the ever again. This is a defensive action on the part of MailChimp. They have a lot of mail servers who send out the messages you book through their service. Each time a recipient marks one of your EMDs as ‘spam’ this sends a negative message about that server and MailChimp act to protect their reputation in this way. https://creativeagencysecrets.com/wp-content/uploads/2018/02/unsubscribe-or-delete.png 284 714 Rebecca Caroe https://creativeagencysecrets.com/wp-content/uploads/2014/04/CAS_Logo_1line_RGB.jpg Rebecca Caroe2018-02-27 10:40:562018-02-27 10:40:56Delete or Unsubscribe for mail list? 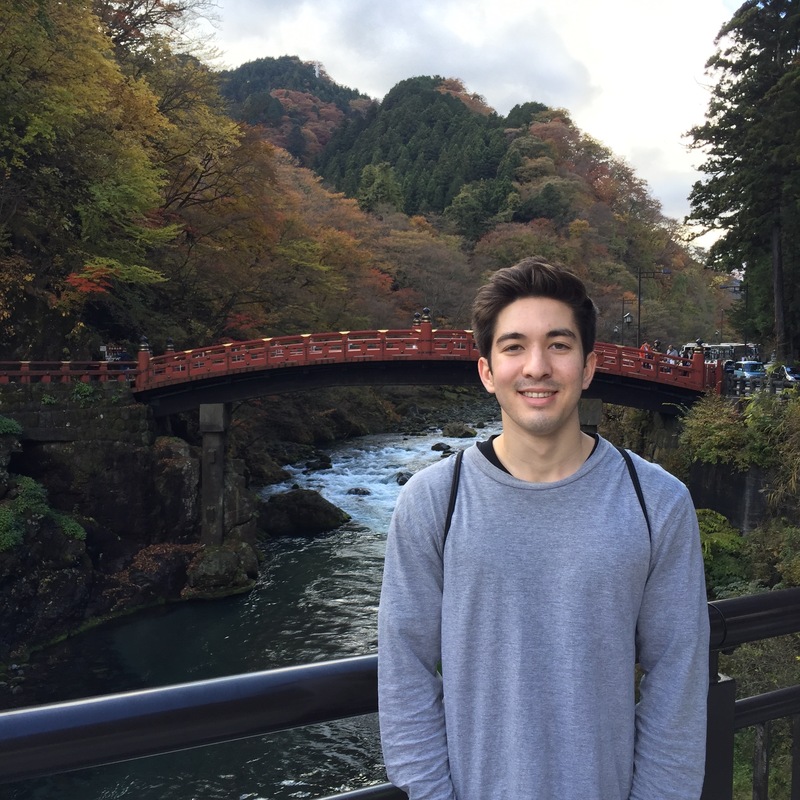 Hi, my name is John White and I am currently a university student majoring in Marketing and International Business. This summer, I had the privilege to be the latest intern for Creative Agency Secrets and I am grateful that I chose to do it. The motivation behind working as an intern here was to gain some real-life experience that I had lacked so far in my degree. Even though it was a short amount of time, I can truly say I have fulfilled my goals here with the help of Rebecca, Tabhitha and Conrado. It is quite incredible to think that within a space of a month, I gained more experience and knowledge at Creative Agency Secrets than I have had at university so far. The team set me a lot of tasks for clients right from the start, which meant I was gaining the real-life experiences I craved. I was using email campaign tools such as Campaign Monitor and MailChimp to design campaigns for clients. I created blog posts for various websites, where I learned a lot about writing that I wouldn’t have even thought about. I even got to work on the back end of websites using platforms such as Squarespace, WordPress and Shopify. Other great marketing facets I got to experience included SEO, copywriting and market research. Besides marketing, I learned a lot of about what is required to have a functional and a well-performing team. I quickly realised how important constant communication was to be efficient as a whole. Using tools such as ‘Teamwork’ and having stand-up meetings every morning, I always knew what my task was and more importantly, what everyone else was doing to make sure we were all on the same page. No matter what I do in the future, these sorts of experiences are invaluable and can be applied to whatever I do. All in all, I owe massive thanks once again to Rebecca and the Creative Agency Secrets team for giving me this opportunity. I now feel more confident in pursuing marketing jobs once I have graduated since I have experience working in a team and with various tools. Also, a massive thank you to Tabhitha who walked me through a lot of the different jobs I had to do. With everything being new to me, she showed a lot of patience, expertise and I always felt comfortable asking different questions! I wish everyone all the best and hopefully, we will cross paths again sometime in the future! Rebecca is running two webinars with CCH Learning designed for Business to Business organisations who need to ramp up their website as a marketing tool. Get your Business Website Working for you: Learn how to “drive” a website to get enquiries and visitors. 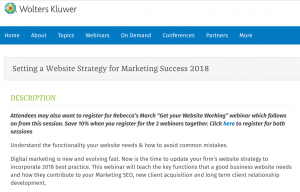 The first webinar will help you gain a deep understanding of how to write a website strategy, what to improve on your current website and marketing communications, how to test your website is working well. The second webinar teaches you the tools you need to assess the effectiveness of your existing website, and helps you to draw up a list of actions to improve its alignment with your business website strategy. Most cases, you’d want visitors to stay on your site. Hopefully, they’ll explore other pages and, ideally, fulfill your desired conversion – whether it’s signing up for a newsletter or buying a product online. If a lot of your visitors are ‘bouncing’ away from your website without performing any desired actions, you know it’s time to do something to reduce that percentage. But where do you start? By signing up for our upcoming seminar, of course! This event is based in Ponsonby, Auckland, but if you can’t make it, simply sign up for a video ticket instead. Simply click here to book a video ticket! Breakfast, tea and coffee is included! Free on-street parking is available! We’re holding a breakfast seminar on the 1st March and need a video producer to help record our event. This involves filming the 1.5 hour event and post-production editing to include the slides and audio. There’s no need for fancy graphics. The event is maximum 30 guests and will have only one speaker. We have a microphone to record audio if needed. Send your application to Tabhitha Tang by 21st February. Are you an agency needing more work? If you are an agency or a freelancer looking for the easiest way to get new client work – you’ve found it. Join our “Sub-Contracted services email alert”. Enter your details below and you’ll automatically be emailed every time we have new projects available. Enter Your Email To Receive Our Latest Projects instantly. Getting recognition for your “expertise” in selling professional services is paramount if you’re to make good profits. Monte Carlo simulation is commonly used to evaluate the risk and uncertainty that would affect the outcome of different decision options. You can’t get these conversations going without first establishing yourself as an expert. Nobody wants their finances managed by an amateur. Nor their marketing services. Just working for a big name firm is no guarantee of expertise – it’s a step in the right direction. Getting in front of future clients is possible via step 1. As you establish yourself as an expert you will get noticed (particularly if you use key words relevant to your expertise and audience. Maintaining your position as an expert in the eyes of your audience can be continued through outbound articles and publicity. These are best delivered using sites aligned to your industry niche and audience. For my area there’s a great Reddit thread, a couple of Facebook Groups and a Linked In Group which is very active. You need to find the ones suited to your needs. Don’t forget to check out in-person events on places like Meetup.com too – not all communication has to be written! Finding the right things to say in your publicity and how to start a conversation with your reader are the things you will need to practice. Conversations in a public forum can lead, later, to a private discussion which is preliminary to taking on a new client. Book a personalised coaching session with the Creative Agency Secrets team – pick the person who best suits your need. Every business hoping to seriously compete in the modern world needs a website. For some businesses, the website is merely a hub, a way that customers can find out vital information and get in contact should they need to. For other businesses, their website is a vital component of the way that they operate. In many cases, their website is generating most or all of their revenue. In order to effectively sell products through your website, you need to be able to do more than just generate traffic. You will need to also entice visitors to your online shop and then convince them to part with their money. Selling products effectively through your own website is also not a problem that can easily be solved by spending more money on marketing. Instead, selling products on your website requires a more considered and multi-faceted approach. In this article, we look at some of the most effective techniques for boosting sales from your website. Whenever a potential customer sees a product for sale on a website, one of the first things they will look for is customer reviews. These will give them an indication of what other users and customers think of a product, and research suggests that reviews from other customers are often trusted more than reviews from specialist industry publications. In order to generate as many customer reviews as you can, you should make the process as simple and quick as possible. You should also offer customers an incentive for leaving a review, if you offer any kind of loyalty or rewards scheme, then consider offering some bonus points or discounts. A well laid out and easy to use website will find it much easier to generate traffic and to convert those visitors into customers. If your website is difficult to navigate and sluggish to respond, then anyone who visits will soon become frustrated and leave again. Not every visitor to your website will have the same idea of what constitutes a streamlined website, so it is a good idea to allow users to customize the layout to some degree. A good example of a customizable layout would be this page from Woodbury Outfitters which sells, among other things, browning hunting rifles. This page allows the user to arrange items as either a grid or a list; it also makes it easy to see the kind of rating they have been given from other customers. Search engine optimization (SEO) is a crucial weapon for any modern website that wants to be noticed. Any fully rounded marketing strategy has to include some kind of SEO component. Put simply, it is a website’s SEO score that determines how prominently it is listed in results for relevant search terms. A website is an excellent platform for selling your products, but to do so effectively isn’t as easy or straightforward as many people think. You need to consider exactly how you can make your website as simple and inviting as possible for customers to use. If you build your website carefully and pay attention to your user base, then you can quickly make a lot of money from your business website. With many services out there for marketers, producing content and getting it to your audience has never been easier. However, not all services are trustworthy. We recently came to learn about TopBuzz, a platform that has divided opinions. 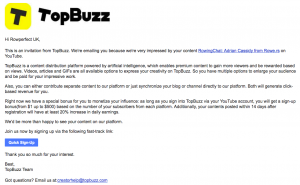 A couple of weeks ago, we received an email out of the blue from TopBuzz, a content distribution platform, claiming to be ‘impressed’ by a video we did for a client. The email content was quite generic and seemed to be automated. 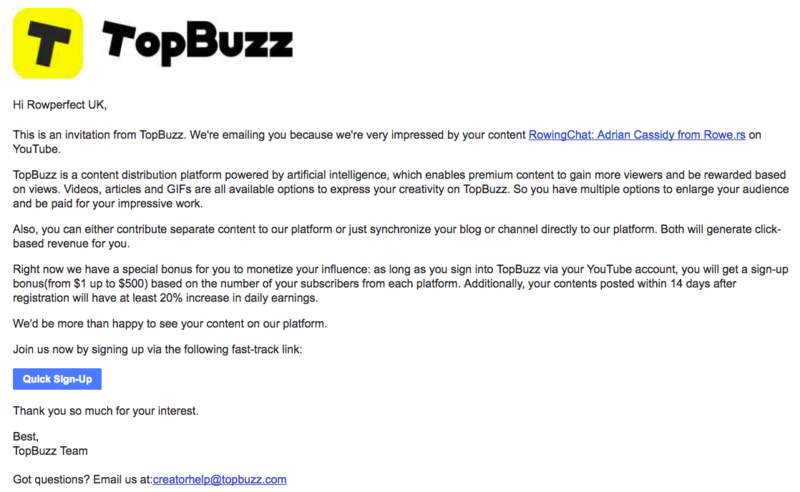 TopBuzz said they were able to enlarge our video audience via their platform and we would be compensated for all the views we got. A couple days ago, we received another email. This time, it was from a person claiming to be from this company, boasting about the number of active users and the number of views that all the videos get that are shared on their platform. She was very forward in her approach and encouraged us to become a ‘premium creator’. Now, we did a little bit of research on these guys and it was scary to see what would have happened if we signed up with them. According to past users of the platform, the communication from TopBuzz is poor and scarce if you ever try and contact them. If you have a problem with something, TopBuzz are unlikely to help and at best, you might receive template emails that are likely to be irrelevant. This brings up the next problem. If you are unhappy with the platform…too bad. You can’t delete your account and your content will stay on TopBuzz’s platform forever. However, it gets worse! TopBuzz can use any videos uploaded to their platform in whatever way they want. Say you work hard and make a viral video. If that video is on their platform, they can publish it as their own and you would get no credit. Unfortunately, most users only realised that this was their fate only after signing the contract without reading the small print in their T&Cs. We were never interested in using this platform in the first place as the video we created for our client was content produced for a niche segment, it was an hour long and was a face to face interview. Targeting a mass audience and making revenue off views was not on the agenda, therefore, using this platform would have been unnecessary. If you are producing viral videos, pursuing avenues through social media seems to be a safer option. For example, with Facebook, there are various pages that are dedicated to redistributing content according to different tastes. Nevertheless, it’s important to be aware of dodgy services like this so be sure to do your research before jumping in!